It was meant to be a bold display of a transportation utopia. Instead, it rained - ever so slightly - and the whole thing was called off. The SureFly passenger drone, due to make its maiden voyage on Monday, stayed grounded over safety concerns. The mild drizzle in the cool Nevada air apparently proved too much for the craft touted, by the company at least, as the future of commuting. The drone was given permission to fly by regulators just last week. The two-person electric-diesel hybrid is said to have a range of 70 miles (113km) and it is intended that it will one day work autonomously. Billed as one of the highlights of this year's CES trade show, press had been invited to witness the flight at nearby Boulder City Airport, but "inclement weather" meant it was cancelled early Monday afternoon. Asked about the weather, an employee at the airport told the BBC: "Right now it looks like it could be sprinkling very softly." Similar ideas have been tested in other parts of the world, most notably in Dubai, where German firm Volocopter flew its 18-rotor drone in September last year. 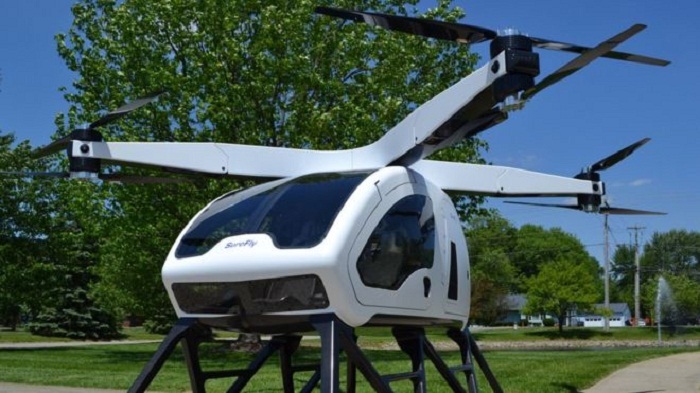 The SureFly drone, made by the Ohio-based Workhorse Group, has four propeller arms holding a total of eight propellers. It is said to be able to carry up to 400lb (181kg). Workhorse told the BBC: "The SureFly is a purpose-built experimental aircraft and the fuselage on the SureFly at CES has not been waterproofed, although it will be on future production models. "To avoid potential risks associated with rain affecting the aircraft’s electrical system and the SureFly’s rotor blades, the SureFly’s first flight has been postponed." Patrick Miller, from Unmanned Aerial Systems Magazine, said such delays were not unusual and that the company was wise to avoid any remote risk of a malfunction. "With an unmanned aircraft designed to carry a person," he said, "why risk negative publicity by flying in rainy weather?" Workhorse said it hoped to carry out the maiden flight soon.